From the original clone-tastic One For All to the sand-strewn battlefield of Ascension, rotating game modes provide unique spins on the classic League formula. It’s time to kick things off with the next game mode in the rotation: All Random Ultra Rapid Fire. 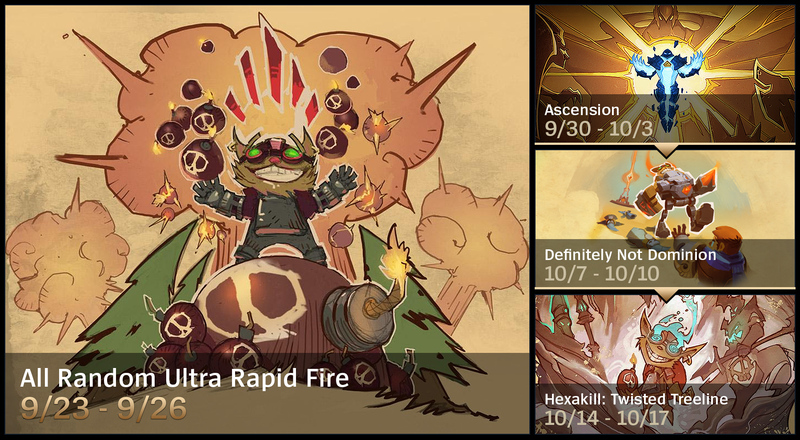 URF is back, now with two new letters. ARURF is the 80% cooldown, infinite mana insanorama you know, but with randomized champ select kicked in for good measure. Here. We. Go. ARURF takes place on Summoner’s Rift, but it wasn’t an easy call. It was a toss-up between URF’s legacy on the Rift and the traditional home of random shenanigans on the Murderbridge, so we threw the shopkeeps into a cage fight and the Summoner’s Rift crew won. Silent but deadly types, from what little we heard. Champ select in ARURF is just like ARAM: a random selection from owned champs plus the weekly rotation of free champs. Rerolls are shared with ARAM, so using one in either mode consumes it in the other. To compensate, we’ve increased the rate you rack up rerolls for the weekend. You should stack a reroll every game or two. Dodge penalty timers for ARURF (and other normal queues) are increased to 10 minutes and 20 minutes, mainly because dodging a random champ is considered an act of cowardice. It also slows things down for everyone else. Don’t be that player. We’ve specially tuned Champion Mastery so you can earn points in ARURF. You’ll also be able to earn keys for your wins and loot chests for your (or your premade’s) S­-, S, and S+ games. ARURF is now available and blasts through Sunday evening (we’ll shut it down very early Tuesday morning--usually between 1:00 AM and 3:00 AM).